The Stanford Center on Longevity (SCL) estimates that by 2050 more than one in five (21 percent) Americans will be at least 65 years of age. That is nearly double the ratio from 2010 and almost three times what was seen during the 1950s. Traditionally Americans of this age would be retired but a growing number of people are continuing to work well past the age of 65. In fact, projections using Bureau of Labor Statistics (BLS) data suggest that more than a fifth (23 percent) of all Americans ages 70-74, and 14 percent of adults ages 75-79, will still be a part of the U.S. civilian labor force in 2024, roughly double the proportions seen in 1994. 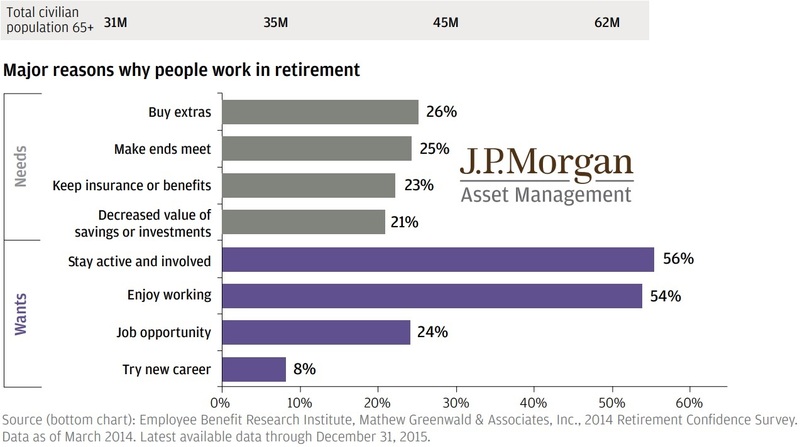 Why are more people continuing to work in some capacity during their retirement years? Some do so out of necessity, e.g. earn a few more years of income in order to make up for inadequate savings, and others opt to postpone retirement because they simply enjoy working and desire to stay active and involved in old age. Regardless of why people may want to put off retirement, many are potentially at risk of overestimating their ability to continue to work in old age. Indeed, it is true that medical advances are allowing people to live not just longer but also healthier lives. This alone, though, does not guarantee that a person will be able to maintain a desired form of employment in old age. For example, it is widely recognized that blue-collar workers retire relatively early because their jobs tend to be physically demanding but a new study from Boston College’s Center for Retirement Research suggests that even some white-collar occupations face age-related challenges. Specifically, the researchers said that “For white-collar workers that rely on fluid cognitive abilities, quick reaction times, and fine motor skills, retirement tends to occur relatively early. Thus, the notion that all white-collar workers can work longer or that all blue-collar workers cannot is too simplistic.” Such findings could be relevant during the renewed discussions in Washington on increasing the age at which U.S. workers can claim their full Social Security benefits. More importantly, the study provides another reason why people should not assume that they will always be able to postpone retirement and continue working in case there is a shortfall in their savings. Instead, the best way to ensure financial security in old age is to start setting money aside as soon as possible.